Cinando for Android provides film professionals registered on Cinando.com with on-the-go access to the leading online network in the industry. The app works offline by downloading the data instantly in the background task, so no preparation is required beforehand. Clink here to download the APP ! Based on Cinando for Android App Cinando iPhone App offers the access to the full Cinando database even offline. Like Cinando for Android, the iPhone app has a market and non market mode and the research results can be easily narrowed down and saved in a list thanks to filters and comfortable interface.. The movie Viewer / Cinando Viewer app : is designed for buyers who receive the special iPad invitations to watch films. The films are downloaded to the iPad for the offline screening and are highly secured to prevent any piracy issues. Cinando iPad Presenter app has been conceived for presenting your line-up to buyers during markets in the most efficient and easy way. 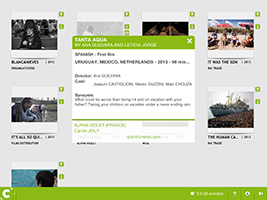 The app includes the selection of your films including the synopsis, the genre, the duration and even pictures and trailers. If several members of your company upload the app, they will automatically have the same film selection that they can manage individually (bookmark films each of them shows or use various filters). 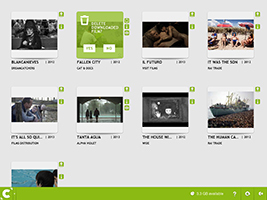 Cinando Video Library is a digital solution launched by Cinando in 2013 which allows festivals to show their selected films online, in streaming. 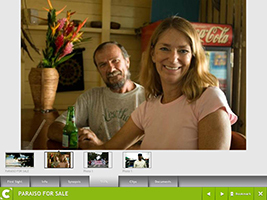 Features of the Cinando Video Library are customizable from the page design to the guest list, the films list and the geographical access. Cinando Video Library uses the same high levels of security as the screening room on Cinando website. 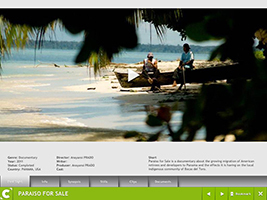 Each festival that chooses Cinando Video Library has its own dedicated website. Clik here to visit the Cinando Video Library website !